Since Nicki Minaj introduced her name, the industry has never been the same. Blatant lyrics, stage presence, alter ego – Minaj always give her everything to stay on top of the game. She is her own competition. Yes, the fans have waited for almost four years for the follow up to “The Pinkprint.” The long gap also got the media bored that they tried to bring her down, painted her out to be the bad guy, doubting her skills, and started praising new names of female rapper – all because Nicki’s identity will always be a headline. But the wait is now over and it is true that great things take time. Despite that it is hardly popular to really sit and write the art, Nicki sticks to her talent and finally deliver her newborn baby, “Queen.” It really opposes to today’s rap music which is mostly dependent on the production and lyrics about stripper. This time, Nicki teaches people how Hip Hop should be. Kick start with “Ganja Burns,” a perfect choice to direct you to the whole album’s character. It lets you imagining yourself in a brownish orange atmosphere, desert-like, just like the album cover. 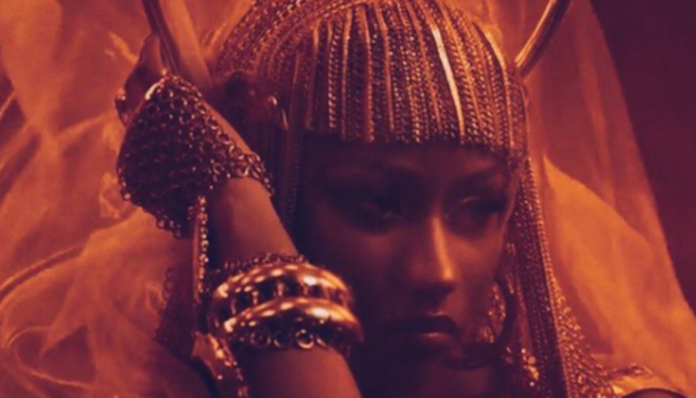 Guided with guitar strings and beats of drum, Nicki speaks about how her blood, sweat, and tears all contributed to her success and how uneasy it is to claim it in this moderate pace track. “Barbie Dreams” peaks the emotion for this album. This instant anthem begins with “R.I.P. to B.I.G.” while she incessantly raps about women’s pride atop sampled Notorious B.I.G.’s “Just Playing (Dreams).” She jokingly hyakuretsukyaku’s her male coequals, explaining why there would be no home run at night. Roman Zolanksi also makes a cameo here! “Majesty” appears for another high moment. If “Roman’s Revenge” had a rebellious sweet sister, this track would be her. With contributions from Eminem and Labrinth, this is the perfect example of dander, technique, and melody. Nicki shuts down the rumor saying she doesn’t support other female rappers with an agitator, “Coco Chanel,” which enlists Hip hop Princess, Foxy Brown. This dark number is thrilling with both of these Trinidadian-American acts throw strong punches over the dancehall themed beats. The team up will surely cause some casualties. Nicki doesn’t forget to incorporate her pop ambition here, either. Nicki Minaj is extremely attentive when it comes to her music. She doesn’t rush and it is all paid off with this splendid masterpiece. They may doubt on her reign. They may compare her. They may try to replace her. The truth is, Nicki Minaj is inimitable and that she is truly the Queen.